When it comes to strict retention requirements, a 30% data growth per year can rear its ugly head. 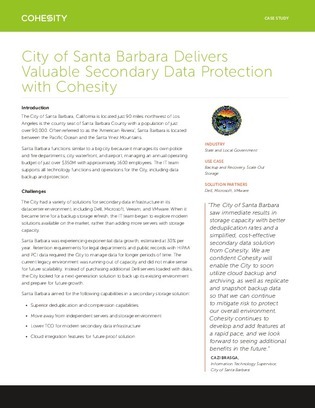 In the City of Santa Barbara, for example, retention requirements for HIPAA and PCI data required the City to manage data for longer periods of time—an encumbrance on its backup environment which was running out of capacity and did not scale cost-effectively. Their only option in keeping the system was to buy more servers loaded with disks. After evaluating options and costs—including comparing Cohesity and Rubrik—the City decided to pursue converged data protection for strong on-premises support and to prepare for scale-out expansion. To learn which solution they chose and the results, read on.